What I hope you gather from this story is that this car has been a lot of fun for me. I have driven it a lot, all over of the country. I have also fixed a lot of things, many not mentioned in this post. You become closer to your car when you work on it. You also gain confidence that you can drive it anywhere because you can fix it if something does break! I have a lot of posts that I’d like to write but a lot of them are works in progress. I wanted to start with one that showcased my true passion for cars. I will share with you my the story of my first car. Buckle up the racing seat belt and hold on because this will be a bit of a long one! 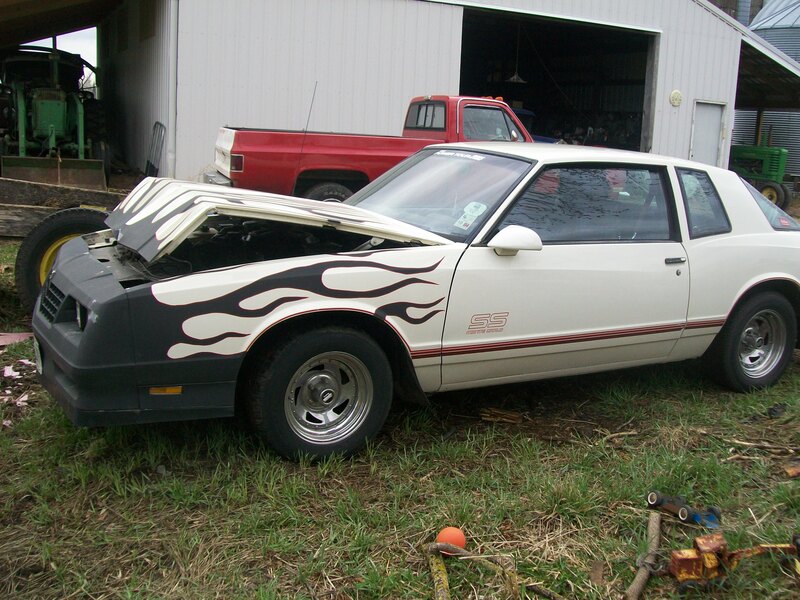 My first car ever was a 1987 Monte Carlo SS Aerocoupe. My uncle found it in the for sale section of http://www.montecarloss.com when I was 15 and a half years old. At the time the plan was for me to buy the car and my father or uncle would pay me back, or something to that effect? Who knows how true stories like these actually are? Anyway long story short we purchased this car from a man in Arkansas (Arr-can-sauce? ), or Tennessee, or Kentucky? I can’t remember, that was 10 years ago! All the main bearings were spun on the original 305 but the body was in great shape. Growing up in northern Wisconsin I was used to copious amounts of rust on every vehicle I’d ever seen. I purchased two used Chevrolet 350 small blocks from The Trading Post, newspaper for $400 and my dad helped me install the “new” engine in the car. Our test drive was the 2005 Hot Rod Power Tour. It started in Milwaukee, WI. We made it approximately to Tennessee before we had to go home for a funeral. The car performed flawlessly though and I loved every minute of it. The car was my daily driver through my junior and senior years of high school. My first “real” “street race” was the summer after high school. I was on a back road and a buddy from high school was driving by with his 1971 Dodge Challenger, basically the only other muscle car in my school. In all honesty neither of us was really a fast car but hey we were 17 years old! I figured I had him since I had the 350. We both mashed the gas from a rolling start with our slush boxes and he blew me away. I was dumbfounded when I looked at my instrument panel and my heat gauge was pegged! It had never even worked before? I putted to my buddies house and we determined pretty quickly my water pump had fallen off? All 4 bolts fell out? What the heck? While deciding what to do with my life, during the summer of 2006,my father and I took a trip to Wyo tech in Laramie, Wyoming in the Monte. On the way back I smoked a tiny antelope. 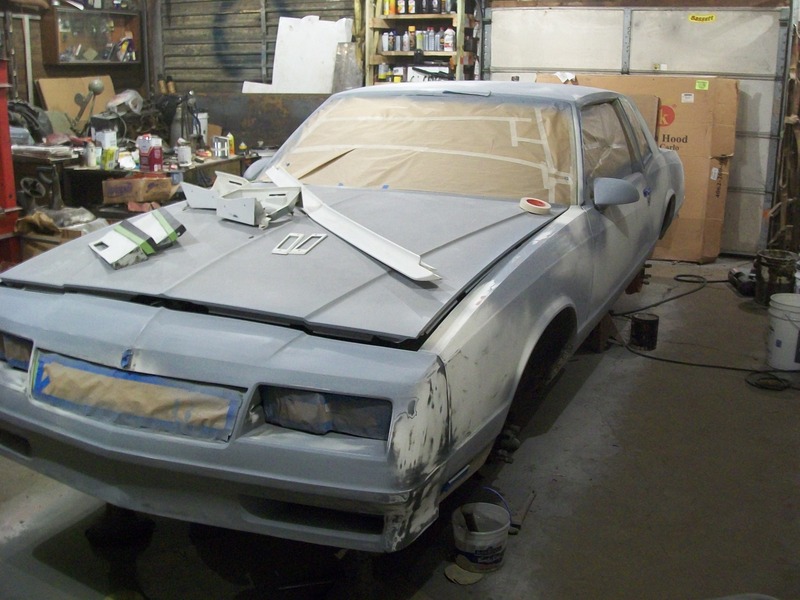 Surprisingly the Monte sustained very little damage but some paint was knocked off the front. I decided now was the time to paint flames on the car rather than try to match the white. I laid out the (not quite symmetrical) flames using a car from Car Craft magazine as a reference, and went to town. I thought this was awesome! In September 2007 it was off to college. Living in dorms and houses with 3 other guys and no garage is not conducive to working on cars, never mind the being strapped for cash part of college. 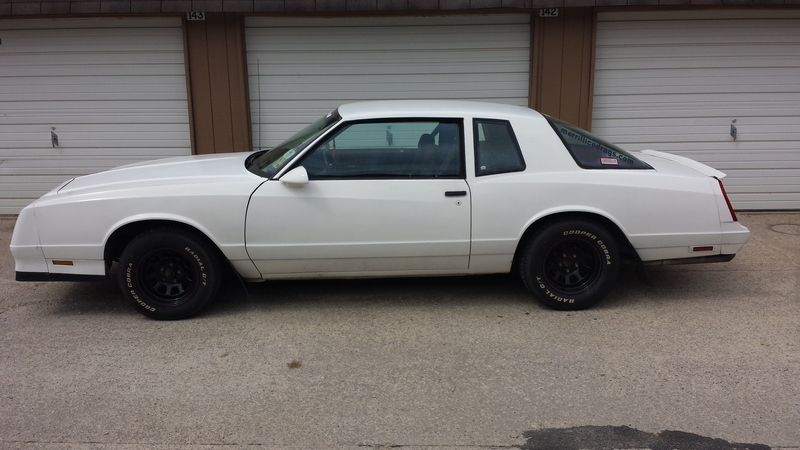 I drove the Monte in spring, summer and fall and parked it for half the year during Wisconsin winters. After my sophomore year of college I took the opportunity to reward myself for all my hard work at college with a set of emissions legal headers and y pipe! I was so excited. One great story of the Monte during college happened during the summer of 2008. I was heading back from the Iola old car show, or maybe it was the Jefferson car show? Eitherway, I ended up going east instead of west and ended in Oshkosh,WI. This was before I had a GPS, or anything more than a trac phone. I thought I could backtrack on mapquest directions.My destination was supposed to be Platteville, WI where I was attending summer school. I finally found my heading and was going through Madison, WI when my car died and i muscled it to the right and into a parking lot as it died. I called my mother’s cousin who happened to live there at the time. We left it in the parking lot Saturday night and Sunday morning we diagnosed a failed fuel pump. $17 later and we replaced it in the parking lot and I finished my journey back to Platteville. Aren’t old cars great! During one trip home, April 13, 2010 to be exact, I parked my car in the one spot in the yard I shouldn’t have and of course it was the one time it wouldn’t start and it was milkman day on the farm. The milkman backed into the front of my car. Luckily it was all perfectly laid out that the ONLY thing that happened was my hood folded in half like cardboard? I couldn’t think of any good analogies there. 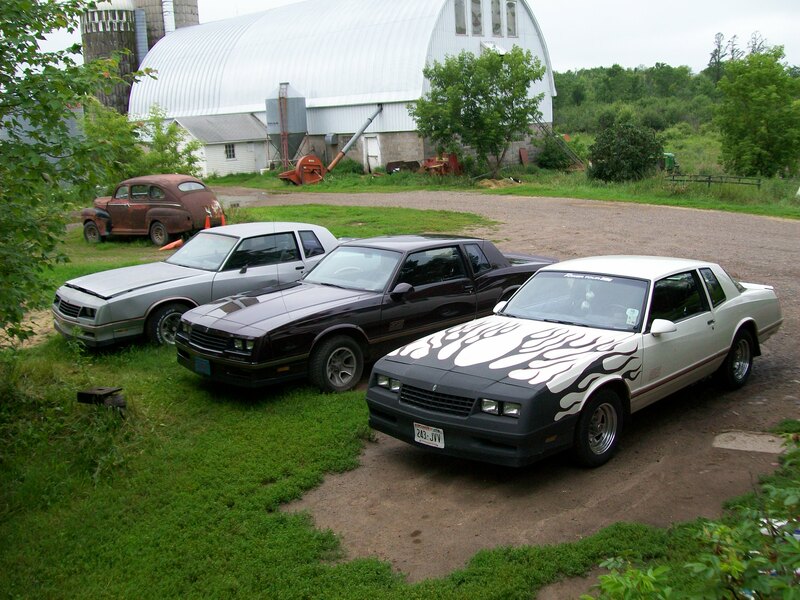 Luckily my father, being the man he was, had three Monte Carlo SS’s sitting around the yard. I “borrowed” the hood of the least likely to run car and drove my car back to college. At this point the Monte was getting pretty “trashy” looking. The flames, the rusty grey hood and the roof paint was peeling off. 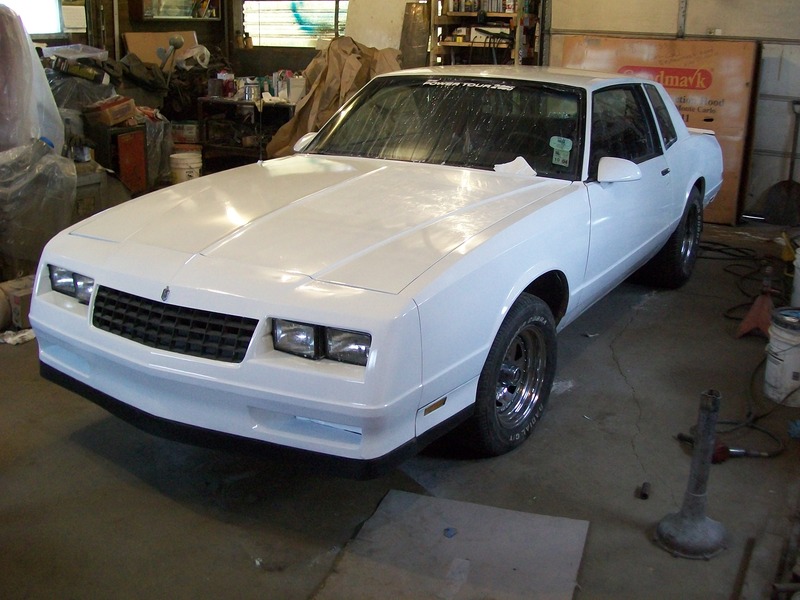 January 2012 I took that 2 weeks of my winter break and painted the Monte single stage white It looked WAY cleaner. In May 2012 I graduate from college with a mechanical engineering degree. I was able to push off starting work until after the 2012 Power Tour from Detroit, MI to Austin, TX. I was a long hauler and my oldest sister (4 years younger than me? ), went with me. We had a great time. By this time friends who didn’t understand old cars began to give me a hard time that my interior was looking “rough”. This was true but in my defense the car was 25 years old at this point. In the last year (2013) I had started to do some minor “pretty” maintenance. I repainted my faded door panels. I found the nice black covers for the interior door straps. I replaced the shattered and acid rain etched side mirrors and repainted a few of the more faded exterior components. 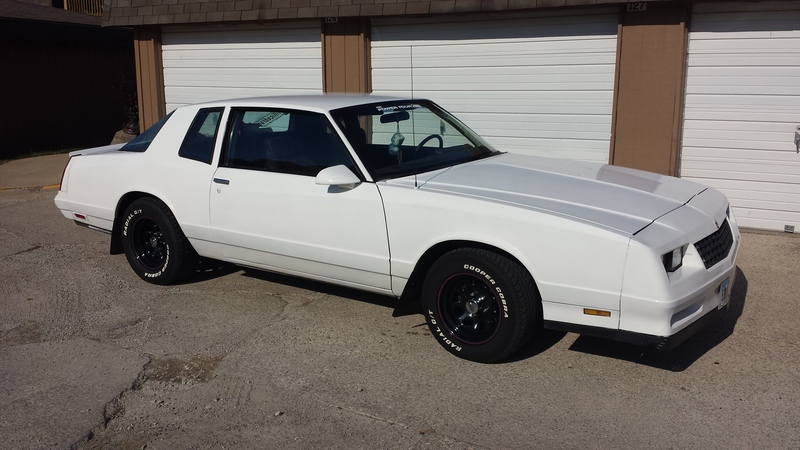 (Door handles, plastic around the gas cap which on Monte Carlo’s is hidden behind the rear license plate, Slick!). It’s pretty incredible what the small things like this do to actually make your car appear a lot more “finished”. The last maintenance on my Monte was replacing a starter that had a huge draw and wouldn’t turn the car over at times. I also recently “borrowed” some black rims from the same uncle who found the car for me originally (he has a few Montes himself) and changed the look of the car up a little. I have put over 60k miles on the car since I bought it and I have loved every one. Monte with chrome lug nuts, center caps and white wall wash. 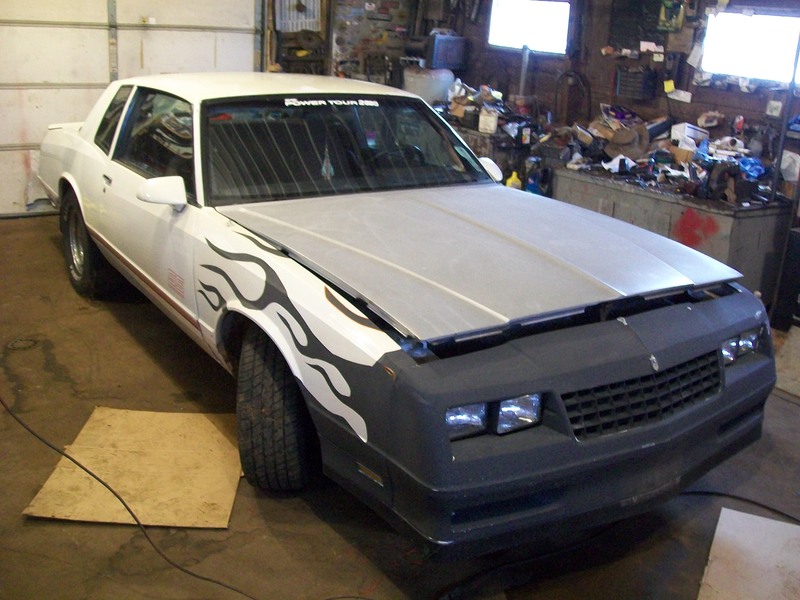 I recently purchased a 2nd car, to be discussed in a future post, so perhaps the monte can be put out of commission, for a while, and made faster! I have great plans, heads and cam swap, rear gears, LS engine? Who knows. I hope you enjoyed the story. Please share any stories of your favorite, or not so favorite car. Have you had it forever? Did you just buy it? As always, I hope you enjoy the ride.